Having to grow up with the fast-paced world wide web, all we need, indeed, is at touch of our fingertips -- yup, including shopping. And with all the time I've spent being online, it was inevitable that I eventually became an online purchaser. I've been buying stuff through websites for as long as I can remember, started way back when Multiply was still alive. Provided you do some research if a seller is legit, online shopping is one of the most convenient things. I don't mind shelling extra bucks just to get my hands on items I know will take serious effort for me to have. I think everyone's familiar with Lazada. They're currently on the forefront of online shopping websites here and abroad. Though I've never personally tried their services yet, I actually browse their site every once in a while just to window shop when I'm too stressed out with work. Hahaha. And what a joy it is to see the wide variety of products they have! My favorite? Their Home and Appliances section. 1. Goodbaby Luxury Ultra Lightweight Stroller. I wanted to gift this to my favorite god daughter, Jaden, who will be christened this week. I've been scouting for affordable but sturdy baby strollers since the start of the year but can't decide on which to buy. I have zero knowledge about babies! But I thought this would be a good one (if I had the moolah to buy it. Hehe.) for that cutie pie! 2. Classic Home Luxe 250 Moderna Comforter. I need this in my life! I'll be moving to another place (for the nth time haha) soon and this would just be perfect for my new bed! I just want to be surrounded by this fluffy thing every waking day! 3. Romoss Solo 5 10,000mAh Black Pearl Power Bank. I don't even know how I survive without a power bank especially when I have a long day ahead of me. A long-lasting power bank is what I need for a day's worth of blogging events or when I'm traveling. 4. Fujifilm Instax Mini 90. I've been very hesitant in purchasing this because I still have a perfectly functioning Instax camera that's been of my service for ~5 years until it decided to give up on me yesterday. Yes, yesterday. Just when I bought a fresh pack of films, it stopped working. What a bummer. On the other hand, I have every reason now to purchase a new Instax camera! 5. Coup card game. I've only played this only once (when we hung out at Moonleaf'+Bunnies Cafe) but it was super fun! It's all about deception and bluffing and manipulation. It's easy to learn and the outcome of each and every game is different! Simple rules but a very strategic game. I'd really like to own one so we can play this whenever, wherever we want to! That's it! How about you? 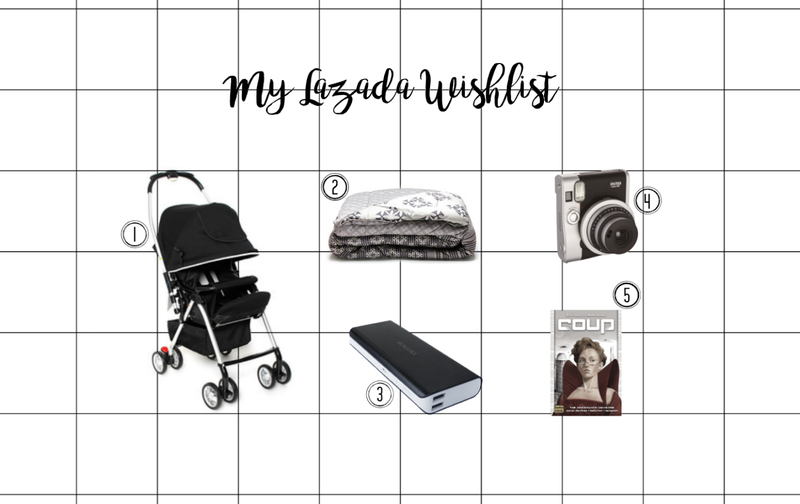 What are your top 5 must haves that can be seen on the Lazada website? I'm gonna go ahead and check out their Home and Appliances section once more because it's just so therapeutic!